Today’s blog confused me a bit as I thought this “festival” was a one-day event, yet some sources suggest it was two days in two different places with nearly the same line-up. I am going to treat it as a two-day event, but with a grain of salt. The second poster with the “KRLA Presents” (as opposed to the first day’s “KFRC Presents”) suggests the two-day two-venue possibility. And I can find no information to distinguish things. 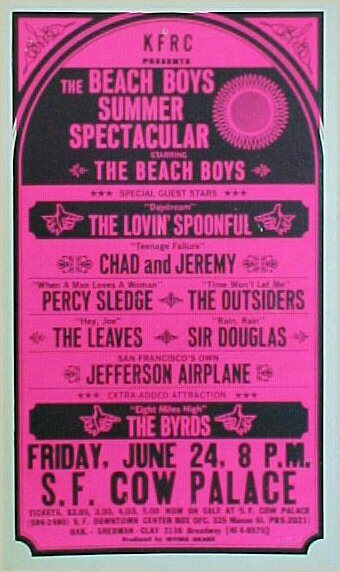 First of all, this was not a 1969 festival and perhaps was not even a festival, but it was a rock music event that was held by an FM-rock radio station in San Francisco that featured some groups that were emerging on the new FM-rock scene. The sponsor of the event, KFRC-FM (and RKO-owned station) had joined the growing number of FM stations that saw rock music as a profitable format. Bill Drake, the RKO General’s national program director, created a system that meant a fewer records, but heavier rotation of the biggest hits, very short jingles, and less DJ talk. One can see the seeds of the “underground” style and album-oriented selection in Drake’s so-called “Boss Radio” style. 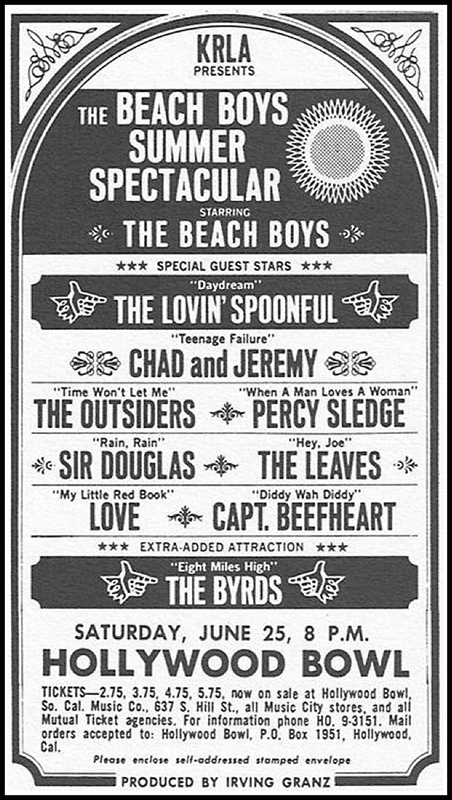 The selection of groups that perform is an interesting mix of styles: the jug band bent of the Lovin’ Spoonful, the soul of Percy Sledge, the San Francisco Jefferson Airplane, the LA folk-rock of the Byrds, some British Invasion with Chad and Jeremy, Cleveland rock with the Outsiders (their big hit, “Time Won’t Let Me,” a bit of Texas/San Francisco mix with the Sir Douglas Quintet, and of course the surfin’ Beach Boys. I am surprised to see Captain Beefhart and his Magic Band (and you should be, too), and Love. With so many bands (either way), the sets must have been short to accommodate so many groups in what was likely a 3 or 4 hour window. The ticket prices were $2, $3, $4, and $5 for the first night; $2.75, $3.75, $4.75, and $5.75 for the second night. The more expensive tickets seem too expensive for 1969. I assume there was no meet-and-greet with the highest priced tickets.